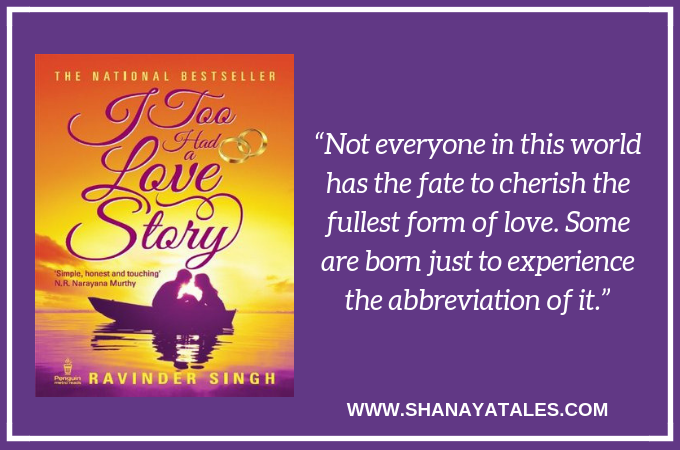 ‘I Too Had a Love Story’ is an autobiographical tale of love written by Ravinder Singh, a software engineer turned author, who rose to fame with this book becoming a national bestseller. 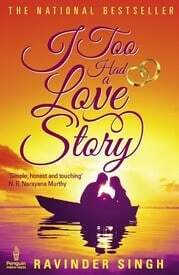 Ravin and Khushi’s love story is the central theme of this book, and it stands out brightly. The honesty with which Ravin recounts the story is refreshing, and his feelings and emotions reflect clearly in the narration. Considering this is a real life story, I feel sympathetic towards the author. I appreciate the intent and emotions behind Ravin’s story, and the amount of personal courage that it must have taken to put his innermost feelings on display for public consumption. Having said that, I find it difficult to overlook the amateurish writing. I do understand that the author wanted to narrate the story ‘as is’, but I believe tighter editing would have made this a far more satisfying read. Also, there is one particular incident in this book, which is just plain weird. It makes me doubt the ‘great love’ this book is based on. There was a crisis (for the lack of a better word to keep this review spoiler free) on Khushi’s end and Ravin was flying out to see her. During the airplane ride, when the love of his life is supposedly in severe danger, he checks out the air-hostess. Yes, you read that correctly. He checks out the air-hostess. Need I say more? To sum it up, if you are looking for a literary piece with a meticulously crafted plot and expert narration, this book is not for you. If all you want is a light read that takes you through the bittersweet experiences of first love, go for it. These lines before the book started..
trying to speak my heart. This book has been an odd pick for me. I normally love my ‘happily-ever-afters’, and a real-life tragedy is even more heartbreaking. However, apart from this book being a national best seller, what caught my attention was the foreword on the cover page written by Mr. Narayan Murthy. A love story reviewed by Mr. Murthy made me curious enough to give this a go. Does this happen to you guys too? How much weightage does a famous person’s review hold while deciding about reading/passing a book? In fact, I love the book and tears rolled down the cheeks. Khushi is one character that I feel I knew for ages. As far as language and editing in Indian writing goes, I feel it is a case of laziness, negligence and an overall ‘chalta-hai’ attitude, because I refuse to believe that it is a lack of talent. Hopefully this changes soon. Sometimes I sigh at the way bad writing reaches a best-seller status. I appreciate your frank and honest review. But bad writing turns me off reading. I always check the first chapter so I can judge before I invest in the novel. My author group condemned’ Fifty Shades…’ when it was first released, but it’s gone from strength to strength. Maybe the public don’t care. I agree. It is so annoying and misleading when that happens. And yes, I do believe that the people don’t care much, but it would be nice if the authors and publishers did care more in terms of putting their best work forward. Bad writing is SUCH a complete put off isn’t it? I think I’ve read this one half way through. As for famous personalities endorsing a book, I have come to realise that many times they don;t even read it and the recommendation are smartly phrased to imply that they did. So not done. I too had a problem with the editing and language of the book, I felt as if it was a badly written diary. But that is just my opinion and so I have not written a review for this book . Also have no plans to pick any other book of his. Nice review, very balanced. Inderpreet Kaur recently posted…Axel & Theo Book Review Blast. I admire and respect Mr. Narayan Murthy so much that I would have definitely purchased this book if not for your review. Amateurish writing is a total no-no for me. Love you straight and to-the-point review. I remember reading one of his books, and after that I have become a bit (no, a lot, actually) wary of the books that have ‘national bestseller’ printed on the cover page!! This book is right in front of me and your review is perfect…though it is based on real-life but the narration is very poor. Would not suggest anybody to read this. Sorry. Thank you so much, Alok. I find it extremely upsetting when I see negligence in editing. This book could have been so much better with tighter editing. Oops. Appreciate the candid review. I will skip this one. Thank you. 🙂 Yes, Khushi was a sweet one. Incredibly sad for her family and Ravin. Knowing the fact that the story is a real life experience of the author brings in a certain bias while reading. At least I felt it that way. I had already given a benefit of doubt on narration and literary score even before reading it. I liked the core essence of the story. I will agree with you that there is definitely room for improvement on various aspects. But I think the author’s target audience was not essentially people with literary inclination only but majorly the mass. And if what I think is correct then the book achieved its goal. Good to find book reviews in your blog. The foreword does cheat me at times. I just hope, it doesn’t always. To each his own. I liked the structure of the review. I have this book…still unread. I think it’s slightly overrated. But, you write nice reviews. Good to connect. Best wishes, Tarang. Some times words are ore effective then any action. This is one of that case. I am not entirely sure what you mean. Please do elaborate.